One video game I absolutely love, that it seems no one has actually heard of, is “Illusion of Gaia” for the SNES. I adore this game, and it gives me no shortage of distress that it’s not available for download on the new Nintendo consoles. ‘Tis a huge shame. Good thing my SNES still works…. Well, in addition to having an interesting story and being a lot of fun to play, this game has its own secret, an extra level that is only unlocked once you collect all fifty red gems. I have played this game countless times, but for many years, I was never able to get all the gems, and frankly, there was no excuse, considering the game actually came with a mini-guide that gave you tips on completing the game, not to mention the location of every red gem. Yes, some gems are impossible to obtain once you progress far enough into the game, but once again, if you just stick to the guide, you should have no trouble finding them. Well, I did finally manage to gather up every red gem, and once you reach this desert town towards the end of the game, you give all your gems to this merchant, and this allows you entrance to a very frustrating secret level. This level has some pretty troublesome enemies, and I find the place to be rather creepy, as well, mainly due to the odd portraits of the guy with the weird ‘stache in the background, whoever the heck he is. It took me a long time just progressing through this place because it was so darn tough, and I kept dying and having to start over again from the beginning. And then, once you do manage to get all the way to the end, you reach a bizarre boss called Solid Arm, whom I hear is from another game the developers made. The video of this level, including the secret boss is below. The secret level starts around 1:50. I gave up once I reached this boss, as I was dreadful at fighting it, and if I recall correctly, I died pretty quickly, but it was pretty cool finally seeing the secret level of a game I have loved for so many years, and it’s nice that one, final challenge remains that I hope to complete one day. If you haven’t played this game, I highly recommend checking it out, if you can figure out how to actually do so, and if you already own it, collect those red gems, darn it! And tell me if you manage to actually beat Solid Arm, because I just can’t. That’s something I miss in most modern games. Secret levels to unlock and explore! Rarely happens anymore since game making is so expensive, but miss it all the same! 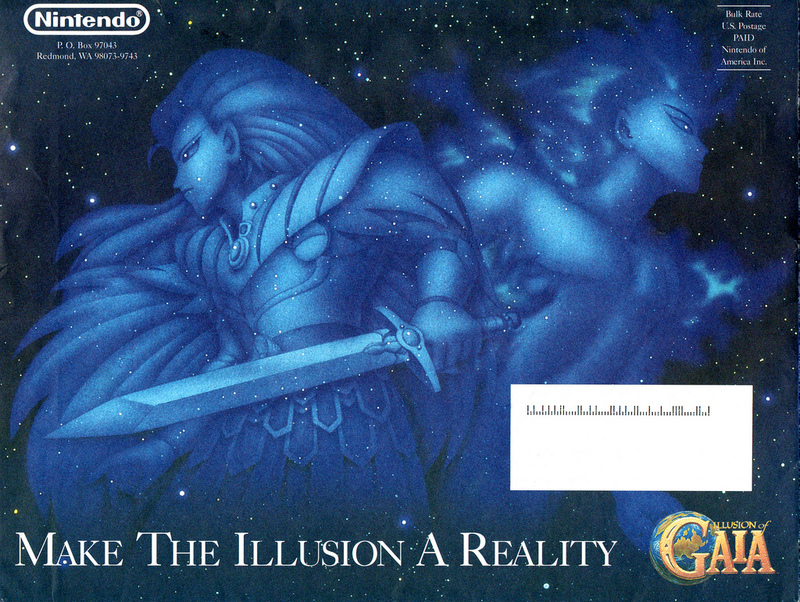 Is Illusions of Gaia similar to Secret of Mana? Might need to track a copy down if it’s as good as you say. I’m not sure if it’s like Secret of Mana, but I do know that it is awesome. I’d definitely recommend it. I miss secret levels. It just feels like developers have gotten lazy nowadays. The cost of games is no excuse because they charge us more to make up for it, but it sometimes feels like we get less. You’re right, it’s not an excuse. With all the broken games shipping these days it’s even less of one. Personally, I think dlc killed the whole concept of secrets and unlockables. After all, why hide something in a game when you can just charge someone for it? And now that consoles connect to the Internet, I can’t get the full version of Hyrule Warriors without it. But, I refuse. I don’t know why, but I refuse to connect my console to the Internet. I miss the old days when games were simpler…. I never managed to defeat Solid Arm. He was simply too tough for me. I heard about him being from Soul Blazer. Is Soul Blazer worth checking out?